Husband prepares a divorce deed on a stamp paper and send one of its copy to female and submits the original in the arbitration council. The husband has to appear in the arbitration council himself or through a council / Lawyer. The arbitration council issues notices to both the parties to appear before the arbitration council on the given time and date. Proper notices are served through the secretary. Two people as representatives are also appointed from the side of husband and wife. Time period for the legal divorce procedure in Pakistan for husband takes minimum 3 months. The family law is very clear in time duration for the legal divorce procedure in Pakistan for husband and the law says that minimum the 3 months period the proceedings will be conducted. The family law for divorce in Pakistan for husband is silent and this provision is manipulated by the arbitration council. The arbitration council on a practical note misuses the provision of maximum time period due to which divorce certificate in Pakistan is never issued in 3 months and the husband have to wait for years to get his divorce certificate in Pakistan. Either you have to bribe the officials heavily or have to wait for years in Pakistan to get your divorce certificate. So it’s better to contact a lawyer in Pakistan who can speed up your work. 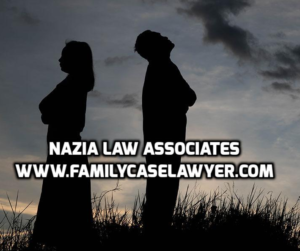 If you are in any city of Pakistan or you are abroad you can contact Advocate Nazia at 00923244207207 she can get you the divorce certificate in Pakistan very easily and very quickly and you don’t even have to wait for months or years . There are many things which are not by the books and cannot be written officially so better consult us as we can get your work done in a week time also. The 3 months procedure provided by the law is for the conciliation between the husband and wife. If you are abroad you can represent yourself through our law firm and you don’t need to specially come to Pakistan for this purpose which will save your money and time both. Please bear in mind that initiating the divorce proceeding or preparing a divorce deed or attending the arbitration council is not divorce. Divorce is legally done when a Nadra divorce certificate in Pakistan is issued to you. So for the legal divorce procedure in Pakistan please contact Nazia Law Associates. : – The legal divorce procedure in Pakistan for wife is called khula which is taken by the wife from family courts of Pakistan through a lawyer. A wife for the purpose of divorce has to appoint a lawyer in Pakistan who will file a case on her behalf. On filing a case in family court, the court will issue notices to both the parties to appear before it. If the husband appears before the court on the date and time given by the family he will submit the written reply of the case. The court will also try to get reconciliation between husband and wife. If the conciliation fails then the court will issue a khula decree in Pakistan. In case the husband and wife says that they can live together as husband and wife the court will dispose off the case. If in case the husband fails to appear either himself or through his lawyer the court will issue orders for publication is newspaper against the husband that a case is been initiated against you and if the husband will not appear on the date given the court will decide the case one-sided against the husband. If the husband does not appears in the court on the date and time given by the court the court will ask the wife to come up for the evidence. If a wife needs a divorce in Pakistan she has to level some allegations against the husband which she through her lawyer has to proof in the court despite of the fact that the husband appeared in the court or not. It is very necessary that a wife should hire a competent lawyer for the purpose of divorce in Pakistan. The first reason is that only a competent lawyer can prove the allegations alleged in the case against the husband and the other main reason to appoint a competent lawyer is that court cases takes years in Pakistan and if you hired a competent lawyer such lawyer can also get the divorce case finish in two months. Our law firm in Lahore Pakistan is an expert in family cases and has handled thousands of khula cases so we can get your khula cases done in two months periods. We conduct the legal divorce procedure in Pakistan in a speedy manner. We can also get you divorce in a week time depending on circumstance. So feel free to contact Advocate Nazia at 00923244207207 for conducting the legal divorce procedure in Pakistan.